Scaling the 6,683-foot mountain was indeed a hard slog. After all, Elisha Mitchell, who famously documented Mt. Mitchell’s height and posthumously gave his name to it, plunged to his death there during a climb in 1857. But early in the 20th century, commercial explorers created motorized routes that put Mt. Mitchell’s summit increasingly within reach. In the summer of 1915, both tourists and logging interests took to the rails with the completion of the Mt. Mitchell Railroad, which spanned a winding, 21-mile route from a base in Black Mountain. It arrived at Camp Alice, a mountainside clearing dotted with cabins, tents, and a dining hall, just a quarter-mile trek from the top of Mt. Mitchell. 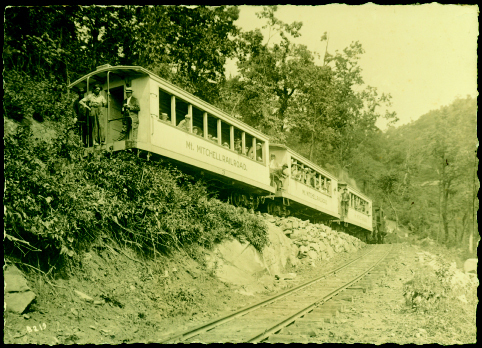 The railroad carried tourists up and down the mountain, and timber on a one-way trip down. Mt. Mitchell’s lofty views proved a compelling draw. “Highest Railroad East of the Rockies,” one newspaper ad boasted. “A scenic marvel presenting a peerless panorama of mountain magnificence.” In the railroad’s first year alone, some 15,000 sightseers purchased $2.50 round-trip tickets, despite the fact that it was a somewhat taxing jaunt. The ride was three hours to the top, and three and half on the journey downward. As much as the railroad opened access to Mt. Mitchell, though, it ravaged it. It took only four years for loggers to deforest most of the mountain, and their operations took prerogative in 1919, so much so that passenger trips were canceled. By 1921, there was effectively no wood left to harvest, so the logging trains stopped as well. By then, Americans were increasingly drawn to a new type of transportation, the rapidly advancing automobile. In 1922, the hastily built Mt. Mitchell Motor Road opened, and caravans of cars streamed up the single-lane bed of rock, dirt, and cinders, on a toll route that mostly paralleled the rail line. A promoter was fond of saying the road was “making the apex of Appalachia accessible.” With dining, lodging, mountain music, and walks among the clouds on offer at the re-invigorated Camp Alice, now just two hours away, it became one of WNC’s ultimate day trips. So great was the attraction that an entrepreneur soon built another roadway, this one from the western, Yancey County side of the mountain. The Big Tom Wilson Motor Road, opened in 1925, was deeply rooted in Mt. Mitchell’s history. “Big Tom” was the renowned bear hunter and Daniel Boone descendant who found Elisha Mitchell’s body. His grandson, Ewart Wilson, commissioned the 11-mile toll road, which, like its predecessor, built a unique culture around a rough-hewn style of tourism. In the late 1930s, the Blue Ridge Parkway opened a modern, paved path to Mt. Mitchell, and the two toll roads closed. Remnants of both are still popular with hikers today, and each fall, the Swannanoa Valley Museum leads a caravan of vehicles up the bumpy bed of the old Mt. Mitchell Motor Road. Of course, most contemporary visitors favor the Parkway as a means of scaling Mt. Mitchell. According to the N.C. Division of Parks and Recreation, almost a quarter million visitors now take that route each year, following in the hard-won pathways of those who reached for the mountain’s heights long ago. Every October, the Swannanoa Valley Museum in Black Mountain coordinates a Mt. Mitchell Motor Road Caravan. A fleet of about a dozen high-clearance four-wheel-drive vehicles makes the four-hour trip to the old Camp Alice site, with lots of stops along the way to talk history. “It’s quite a ride up there, and you see a lot of things that people would have seen 100 years ago,” says Anne Chesky Smith, the museum’s executive director. “But it’s quite bumpy.” Call the museum at (828) 669-9566 to get on board for this year’s trip, scheduled for October 4.